Jetstar has become the first airline to fly direct services between Australia and Lombok in Indonesia, with the inaugural service departing Perth on September 24. More than 150 passengers were aboard the first of the new four-weekly A320 flights. 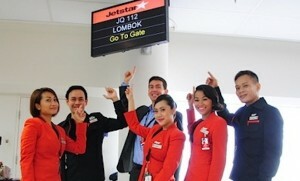 Lombok, which is 150km east of Bali and a rapidly developing tourism destination, is the fifth destination in Indonesia served by Jetstar. “As more holiday-makers have the opportunity to experience Lombok, with its pristine beaches and natural attractions, we expect it will quickly become one of the most popular destinations in our network. Perth Airport worked collaboratively with Jetstar to bring the new route to fruition.